Diagonal Mar is a residential and commercial district located on the coast within the Barcelona urban area. The residential development has a 35-acre park, three lakes, and walking and biking trails but is effectively a gated community, with a semi-private atmosphere. The development has generated distrust amongst neighbouring communities, particularly La Mina, a residential district with the greatest social deprivation in the Barcelona metropolitan area. Just 600 metres from La Mina, the park and buildings are surrounded by large fences that create a sense of exclusion. At night, when the gates are locked, the district becomes a barrier, effectively sealing off access to the sea for communities inland. Gated communities are a rarity in Spain, but they are increasing rapidly elsewhere in Europe. In the U.S. they represent an average of 10% of the new homes market, and more than 30% in the suburbs. They represent a form of urbanisation where public space is privatized. 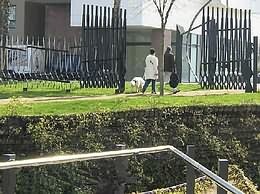 They differ from condominiums and secured apartment complexes because they include public infrastructures and spaces behind the gates, which can otherwise be used by everyone, such as parks. Their promotion by the real-estate industry often focuses on exclusiveness, protection of families in a secluded environment, and leisure facilities such as private parks. � There is no through traffic. The neighbourhood is safer for children. � Gated communities can be safer from crime. � Homeowners have private and exclusive access to sites. � Property values in large gated communities show a better resistance to market fluctuations. � Provides the public authorities with wealthy taxpayers, at no cost. � The development can assist the social, environmental and economic regeneration of a neglected and run-down inner city district of abandoned factories and decaying homes. � The gating acts as a border between the public and private systems and helps to fragment the city. � Diagonal Mar may encourage social segregation and increase La Mina's social exclusion. � The general public are denied access to public infrastructures and spaces when the gates are locked. � Gated communities can create social paranoia due to the security-oriented life-style. � The poorest social classes see a decline in their access to public spaces in the city. � Access control and security features represent a substantial cost for the homeowner. The Diagonal Mar park maintenance costs, however, are met by the city taxpayers. � Gating can lead to a relocation of crime outside the gates and within adjacent non-gated communities. � Gating can have a negative impact on property values in non-gated adjacent neighbourhoods. This may lead to further preventive gating developments in a neighbourhood, as former non-gated communities have to fit gates in order to maintain their property values and avoid crime relocation. This explains the typical U.S. gated community clustered distribution pattern.